Sat outside yesterday evening and enjoyed the sun and a couple of pre-prandial pints of Wadworth 6X which were in very good condition. Purity Pure UBU, Doom Bar and Courage Directors were also on sale so nothing under 4% ABV. Minor shouting matches inside and out suggested a few customers had overdone it on their days out but I suppose this pub's central location will always mean it attracts all types. As the last reviewer commented, a round of drinks wasn't cheap. Good selection of ales of which the London Pride was spot on. Staff extremely friendly and efficient. Some of the clientele though seemed to give the impression that they were of better standing than the majority of customers. Fairly expensive ales but worth paying for! 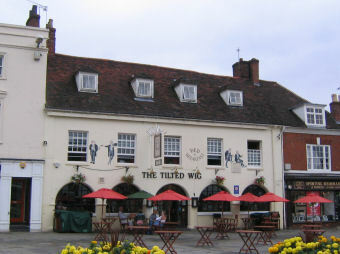 Good pub, went there Friday and the bar staff were very efficent, good meals and a good atmosphere. I went there on friday and was impressed, neat pub, friendly atmosphere and the two barstaff were really friendly and efficent. Good meals at decent prices. Of all the pubs in Warwick - this is my very favourite. Good food, nice to be able to pop out for some tea without being ripped off. Kids welcome early doors, staff always friendly and helpful.